The conscience of a town steeped in prejudice, violence, and hypocrisy is pricked by the stamina and quiet heroism of one man's struggle for justice, in this Pulitzer Prize-winning classic that has been translated into more than 40 languages. To Kill a Mockingbird is a 1962 American drama film directed by Robert Mulligan. The screenplay by Horton Foote is based on Harper Lee's 1960 Pulitzer Prize-winning novel of the same name. It stars Gregory Peck as Atticus Finch and Mary Badham as Scout. 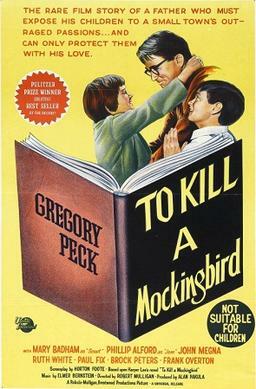 To Kill a Mockingbird marked the film debuts of Robert Duvall, William Windom, and Alice Ghostley. The film received overwhelmingly positive reviews from critics and was a box-office success, earning more than six times its budget. The film won three Academy Awards, including Best Actor for Peck, and was nominated for eight, including Best Picture. If you're looking for books similar to the themes in To Kill a Mockingbird, check out the suggestions below. The one thing you can depend on in Cold Sassy, Georgia, is that word gets around - fast. Olive Ann Burns has given us a timeless, funny, resplendent novel - about a romance that rocks an entire town, about a boy's passage through the momentous but elusive year when childhood melts into adolescence, and about just how people lived and died in a small Southern town at the turn of the century. When University of Michigan sophomore Celeste Tyree travels to Mississippi to volunteer her efforts in Freedom Summer, she's assigned to help register voters in the small town of Pineyville, a place best known for a notorious lynching that occurred only a few years earlier. As the long, hot summer unfolds, Celeste befriends several members of the community, but there are also those who are threatened by her and the change that her presence in the South represents. Go Set a Watchman features many of the characters from To Kill a Mockingbird some twenty years later. Returning home to Maycomb to visit her father, Jean Louise Finch - Scout - struggles with issues both personal and political, involving Atticus, society, and the small Alabama town that shaped her. In a small Cajun community in the late 1940s, Jefferson, a young black man, is an unwitting party to a liquor store shootout in which three men are killed; the only survivor, he is convicted of murder and sentenced to death. Grant Wiggins, who left his hometown for the university, has returned to the plantation school to teach. As he struggles with his decision whether to stay or escape to another state, his aunt and Jefferson's godmother persuade him to visit Jefferson in his cell and impart his learning and his pride to Jefferson before his death. Working for a prominent member of the NAACP in 1946 when a request comes from her favorite childhood author to investigate the murder of a black war hero, Regina Robichard travels to Mississippi, where she navigates the muddy waters of racism, relationships, and her own tragic past. View more suggestions for To Kill a Mockingbird.